Tuberculosis most often causes night sweats, fevers, chronic cough and weight loss, but it is also good at mimicry. The symptoms may be vague and difficult to pinpoint. Intraabdominal tuberculosis is often not diagnosed until the abdomen has already been opened for exploration. A young woman came to the hospital with severe abdominal pain for several days. 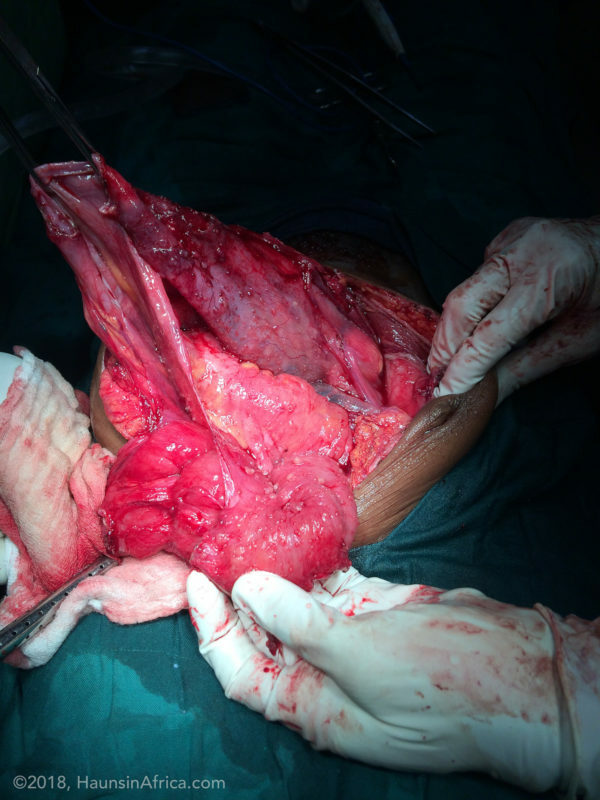 She had a vague history of weight loss and fevers, but mostly complained about the severe low abdominal pain and a palpable mass in her lower abdomen. On ultrasound, we saw a large ovarian cyst. We suspected that the cyst may be twisted around its own blood supply, therefore causing it to be painful. The patient needed surgery. 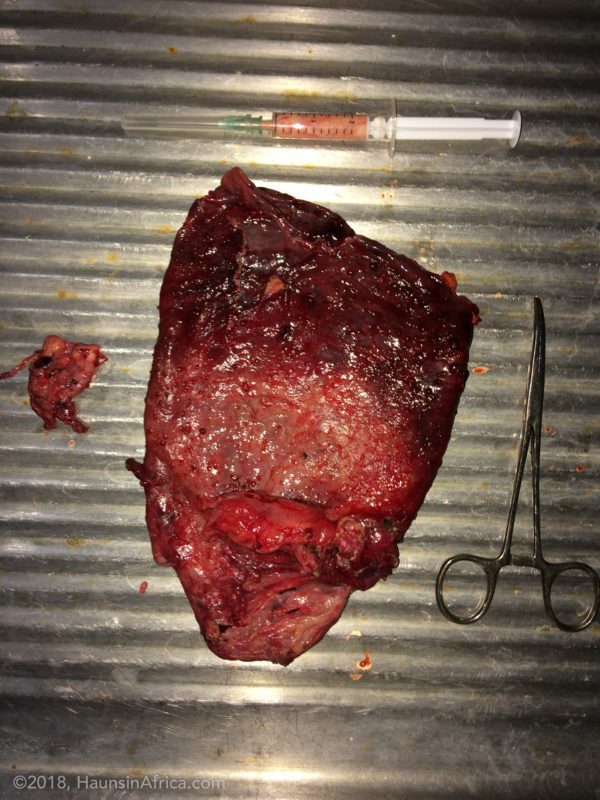 When we opened the abdomen, we found the large ovarian cyst covered in tiny little nodules which were also scattered all over her abdomen. My heart sunk and I thought I was looking at a cancer of the ovary with spread throughout the abdomen. The cyst was stuck to the small bowel and required gentle separation in order not to cause damage to the small bowel. In order to get a better handle on the cyst, we decided to drain it. After draining, we saw a smaller cyst on the right ovary. This cyst was filled with thick, cheesy material. I started to rethink my diagnosis. I removed the entire left ovary with its associated fallopian tube. 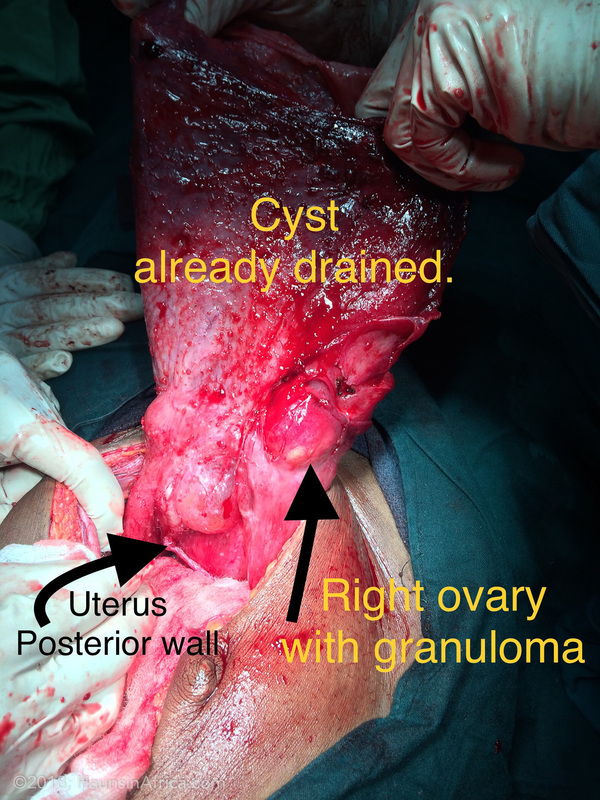 I did not remove the right ovary, but only the smaller cyst on it. I collected the thick fluid into a syringe to also send as a specimen for pathology review. After the patient recovered from surgery, we sent the surgical specimens for pathology review. The diagnosis was tuberculosis of the ovary/ abdomen. She has been enrolled with the public health department to set up the long-term daily observed therapy that is required to cure tuberculosis. Considering the alternative diagnosis of metastatic ovarian cancer, I am happy that this patient can receive proper medications and then go on to lead a fairly normal life.